Anti-Japanese protests took place in cities across China after Japan’s nationalists raised their country’s flag on disputed islands. Thousands of people took to the streets in Shenzhen, Guangzhou and a number of other cities demanding that Japan leave the islands in the East China Sea. In Shenzhen, some demonstrators attacked Japanese restaurants and smashed Japanese-made cars. The islands are known as Senkaku in Japan and Diaoyu in China. Early on Sunday, at least 10 activists swam ashore after a flotilla carrying about 150 people reached the Japanese-controlled islands. Japan’s coast guard is questioning the activists, who had earlier been denied permission to visit the islands. 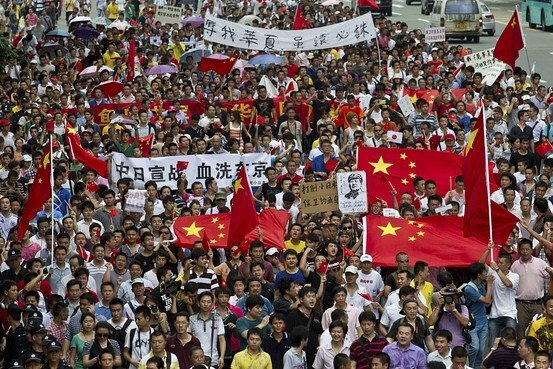 However, as news of the action spread, angry protests broke out across China. In the south-eastern city of Shenzhen, a Japanese-branded police car was overturned and smashed with a metal bar. Footage carried by Hong Kong Cable TV showed other Japanese-branded cars and restaurants being damaged. Protesters waved Chinese flags, burned images of the Japanese flag and shouted slogans denouncing Japan’s claims over the islands. “They [Japan] should return the islands to us and apologize,” said one protester quoted by Reuters news agency. In neighboring Guangzhou, demonstrators gathered near the Japanese consulate calling on Tokyo to quit the islands. In Shanghai, protesters held a banner reading “down with Japanese imperialism”. An estimated 200 demonstrators also marched through central Hong Kong to the Japanese consulate chanting anti-Japanese slogans, broadcaster RTHK reported. In the south-western city of Chengdu, protests shut down a Japanese department store and a branch of the Japanese clothing store, Uniqlo. The outbreak of protests was almost certainly sanctioned by the Chinese authorities, as they were well policed. In the past, the authorities have used anti-Japanese sentiment to deflect criticism of their rule, he says. The Japanese launched their flotilla on Saturday, saying they wanted to commemorate the Japanese who died near the islands in World War II. Early on Sunday, 10 members of the group swam ashore to one of the islets and waved Japanese flags, emulating pro-China activists who had made the same gesture during a previous trip. Earlier this week, pro-Chinese activists sailed to the disputed island chain from Hong Kong in a protest aimed at promoting Chinese sovereignty. Some of the activists were deported by Japan, and others sailed away from the islands. The disputed islands – which lie on a vital shipping lane and are surrounded by deposits of gas – are also claimed by Taiwan. Rows over them have caused Sino-Japanese ties to freeze in the past. In September 2010, relations plummeted after the arrest of a Chinese trawler captain near the islands. The captain was accused of ramming two Japanese patrol vessels in the area, but Japan eventually dropped the charges against him. China claims the islands have been a part of its territory since ancient times, but Japan says it took control of the archipelago in the late 1890s after making sure they were uninhabited.